Continual outbreaks of avian influenza have strengthened the invasion of the virus, breaking the defence mechanism set up by the government in Taiwan. A “Bird Flu Intelligence Agent” goes on a mission to fight the flu, carrying a suitcase with a game inside. The game divides the complicated knowledge of the bird flu and its different viruses into three categories: attack, defence and move. With the help of this interactive and educational game, children are invited to learn how to execute their mission and protect their homes. The suitcase is also equipped with a handy, portable gun, loaded with bullets in the form of hand-washing paper, which only needs water to initiate a hand-washing attack. Furthermore, a special hand-washing jelly was prepared, a mix of alcohol and gelatine that can be rubbed on the hands in order to kill the virus. 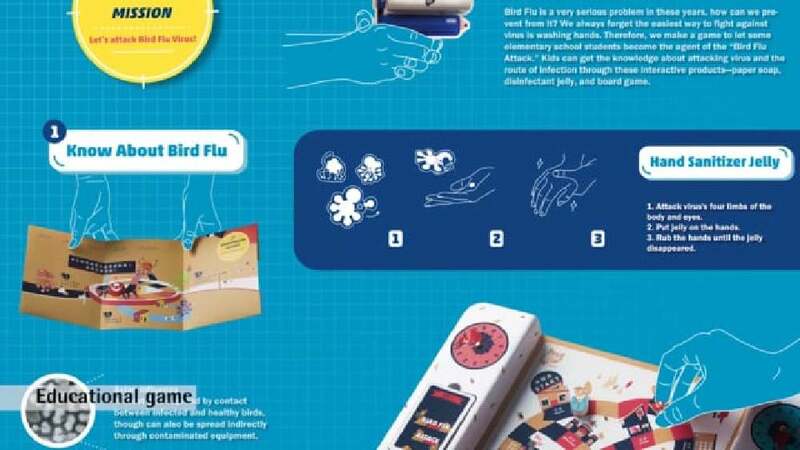 Featuring funny symbols for the viruses as well as child-oriented graphics on the cards, posters and the suitcase, the design invites children to playfully gain knowledge about the disease and understand the importance of keeping their hands clean. “Bird Flu” is a game that combines graphic and packaging design with a well thought-out concept, merging everything into a consistent unity. With its charming appearance and easy-to-understand rules, the game appeals to the target group of children and conveys the message of how they can protect themselves effectively against the bird flu virus in a highly original and skilful manner.